Another Beautiful Day in Paradise. It was a nice day in the high 60's with no breeze. Absentees Bruce, Dorey Anne, Sandy & Glenn and Doug W came. Wendy brought Adam again and Jeff brought Carol and Mike brought Sandy M. Welcome all. We did the regular Clearwater Beach route. It looked like it would be a very nice beach day as it was certainly a beautiful day to blade/bicycle. Rick and Dorey Anne indicated we did 11 miles. We had 7 bicyclists. Doug W and Wendy H became new Sponsors. Pilot Rob H and Mike M renewed their Sponsorships. Thanks for the Web Site support. We Brunched at Mike and Sandy M's as planned. They have a beautiful condo overlooking Clearwater Beach. Now we know how the other half lives. 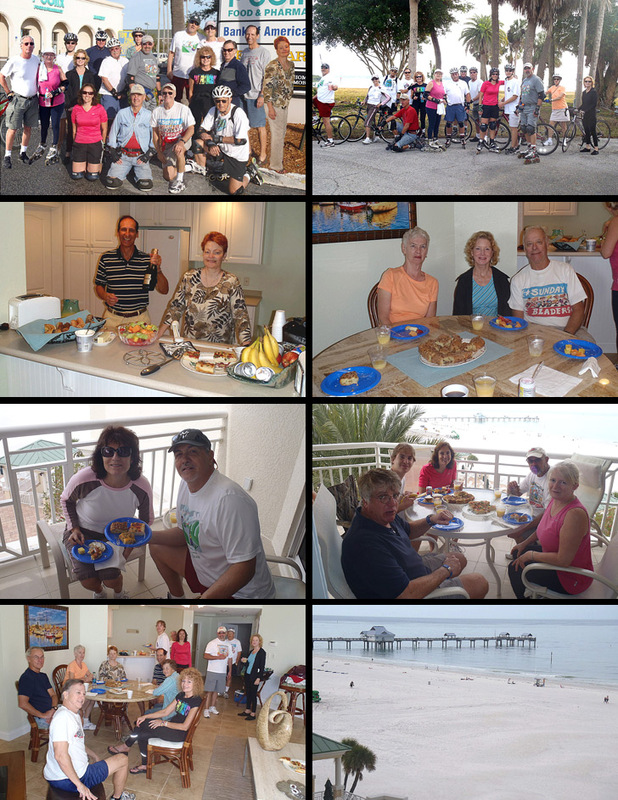 Sandy had prepared lots of delicious food and we all had a pleasant time eating Brunch and viewing the beach and the gulf. All thought about jumping into the condo pool that was calling us but alas it was just a little too cool out. Thanks Sandy and Mike M for a great Brunch and social time.